Registration for the 2017-18 season is now open! Please refer to the Registration page to sign up for another great season of PowerPlay hockey. Join PowerPlay supporter & former Flyer/current Flyers Alumni President Brad Marsh’s team “Ides of Marsh” in the 5k walk/run, 10-mile family bike ride, or 50k/100k bike ride on July 16th. Register & click on fundraising teams to join his team! Proceeds go to Flyers Charities & Flyers Alumni Charities to benefit organizations in the Philadelphia area. 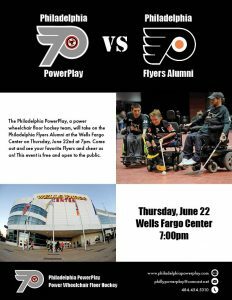 The Philadelphia PowerPlay will take on the Philadelphia Flyers Alumni at the Wells Fargo Center on Thursday, June 22nd at 7pm. Come out and see your favorite Flyers and cheer us on! This event is free and open to the public. View the flyer for the event here. 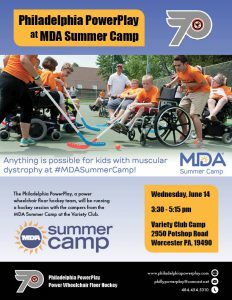 On Wednesday, June 14th, the Powerplay will be running a hockey session with the campers from the MDA Summer Camp at the Variety Club. Looking forward to playing with the campers! Click here to download the flyer. 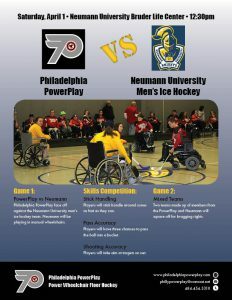 Our next game, on Saturday, April 1st, will be against the Neumann University men’s ice hockey team. Intermission will include a skills competition. Come out and cheer us on! Click here to open the flyer below. Check out new photos from the 2016-17 season, taken by our volunteer Sasha Skorodinsky. We are 2 weeks away from the 2016-17 season opener! This year registration will be online. Click here to register for the upcoming 2016-17 season! The Philadelphia PowerPlay schedule for the 2016-17 season has been announced! Check it out here!